Taylor, aka LD Fly Red Tail, is a 5 year old fawn male born October 22, 2011, who is part of a cruelty surrender of 8 from west Texas on September 21, 2016. His sire is Kelsos Lorenzo, and his dam is Fly Two Forks. Taylor has 104 races to his credit on Greyhound-Data, starting April 23, 2013, in Abilene, KS and moving to Gulf Greyhound Park in Texas finishing his successful career on April 5, 2015. His whereabouts since that time to September 21, 2016, are not known at this time. 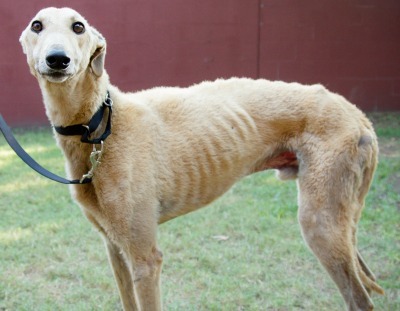 Taylor arrived weighing only 54 pounds, at least 20 pounds under his racing weight, so he must gain some weight prior to completing his medical procedures. It is not known at this time if Taylor is cat or small animal tolerant. Taylor has now gained enough weight to complete his medical procedures. His coat, which looked kind of like a lamb, is now smoothing out. He is a sweet, sweet boy who is loving the retired life and is ready to find his forever home!